Hurricane Maria remains at Category 5 strength. The “potentially catastrophic” storm is packing sustained winds of 165 miles per hour as it churns toward the U.S. and British Virgin Islands and Puerto Rico, threatening to tread on some of islands that were brutalized by Hurricane Irma two weeks ago. Hurricane Maria is now less than 24 hours from Cat 5 landfall in Puerto Rico. Puerto Rico is bracing for a head-on hit from Maria, potentially the strongest storm to make landfall in a century. Maria’s rainbands have already begun scrape the U.S. Virgin Islands and Puerto Rico, but both places will get the brunt of the storm late Tuesday into Wednesday. In Puerto Rico, the National Weather Service is warning of “catastrophic wind impacts” and “life-threatening” storm surge. Rainfall could exceed 12 inches, with some isolated areas seeing more than two feet. 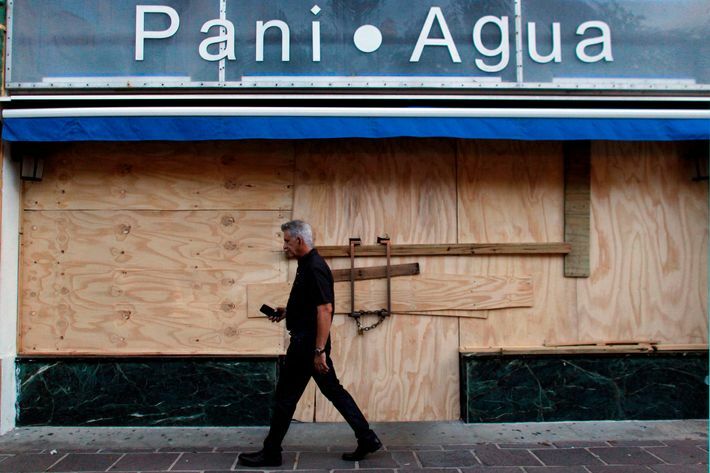 Governor Ricardo Rosselló instructed all citizens to find shelter before the storm. The government is opening 450 shelters to house about 125,000 people. “You have to evacuate. Otherwise, you’re going to die,” Public Safety Commissioner Hector Pesquera warned. About 200 people still remain in shelters and tens of thousands are without power after Irma dealt just a glancing blow to the island, reports the Miami Herald. Maria promises to be substantially stronger; Rosselló warned that Puerto Ricans could be without power for some time. Before bearing down on Puerto Rico, Maria will threaten the British and U.S. Virgin Islands, which have barely begun to recover from Irma. Debris is still strewn across the British Virgin Island of Tortola, where officials fear unsecured wreckage from Irma could be whipped up by the winds and become deadly projectiles. Mudslides are also a major concern, as Irma stripped away much of the island’s greenery, loosening the soil and leaving little to hold it in place. “We’ve been around the world’s shitholes — this is far worse than Afghanistan,” a Royal Marine running ground operations said to BuzzFeed about the islands’ conditions. And that’s before Maria wallops the British Virgin Islands with a second round. On the U.S. Virgin Islands, fears center around the populous island of St. Croix, which dodged Irma, unlike St. John and St. Thomas. Maria is expected to slice about ten miles south of St. Croix, pummeling the island with winds, rain, and heavy surf. St. Thomas and St. John will likely see tropical-storm conditions, but how substantial a blow they receive will depend on Maria’s final track as it approaches the territories Tuesday. No deaths or injuries have yet been reported in Dominica — but conditions sidelined search-and-recovery efforts at least until late Monday. Lines of communication remain down. 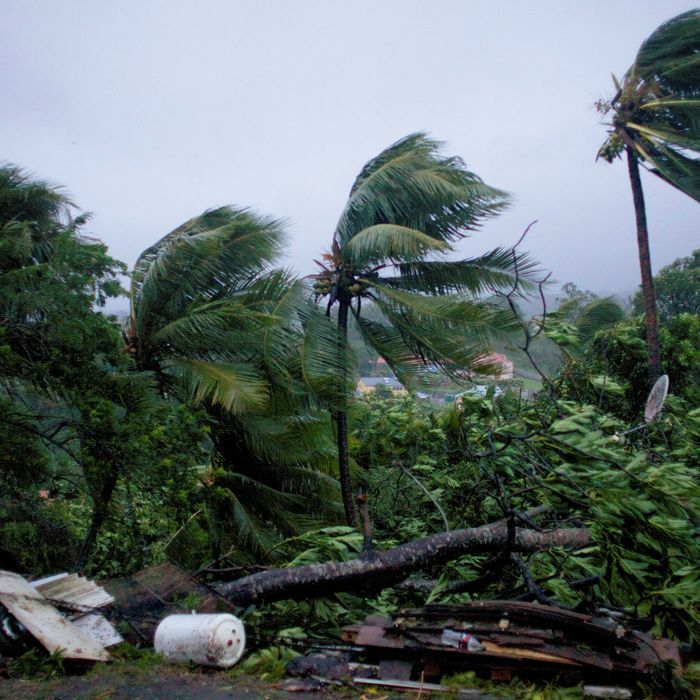 “Where we are, we can’t move,” a police official on Dominica told the Associated Press. Maria also grazed Martinique, where thousands lost power — but that island appears to have dodged the hurricane’s full wrath. “In Martinique, reconnaissance operations are still underway but already we can see that there is no significant damage,” Jacques Witkowski, the head of France’s civil protection and crisis response, told reporters in Paris. Witkowski said a communication blackout with Guadeloupe prevented officials from gauging the level of damage to that island. Guadeloupe prefect Eric Maire reported flooding at the outset of the storm. Videos and photos show winds whipping trees, and roads submerged.